For more information, please visit the JCMI Website. 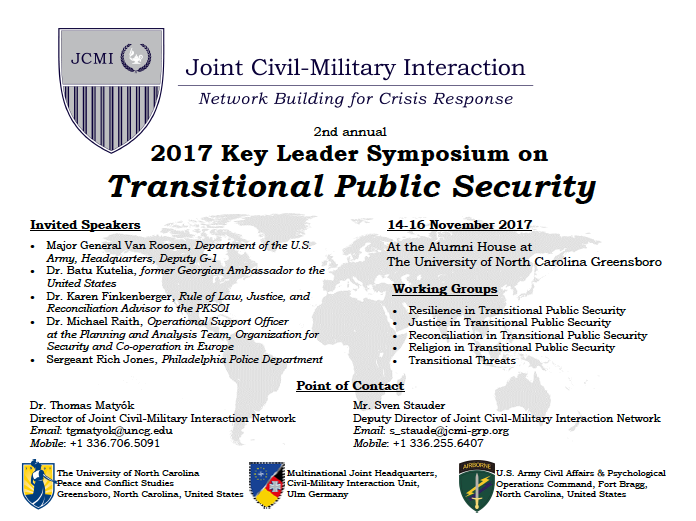 The goal of the symposium is to bring civil society, military, interagency, and academic actors together to take a Walk-in-the-woods to discuss strategic and strategic-operational approaches to joint civil-military interactions in hybrid conflicts as well as humanitarian and peace operations. The symposium is designed to provide participants with the maximum opportunity to interact in an open and creative environment regarding Healthcare as Peacebuilding Activity. Current civil-military relationships often fall short of what is needed to meet human security needs. Changing global antagonisms and hybrid conflicts call for innovative, Whole-of-Society approaches to conflict transformation. 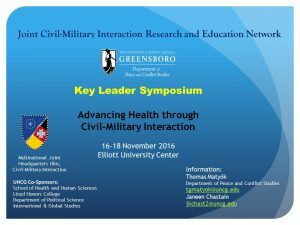 identifying new ways forward in addressing civil-military interaction. We seek to move beyond old debates that have often been counterproductive, and prevented our moving ahead. Rather, we look to engage creative thinkers in building new forms of theory and praxis. 4. Promote public policy initiatives that advance JCMI within peacekeeping and humanitarian response communities. Critical for success of the network is its partnership with MN JHQ Ulm which is prepared to contribute to command and control of worldwide crisis management operations as tasked by the United Nations, NATO, or the European Union. The headquarters is at the forward edge of joint operational planning and doctrine development. 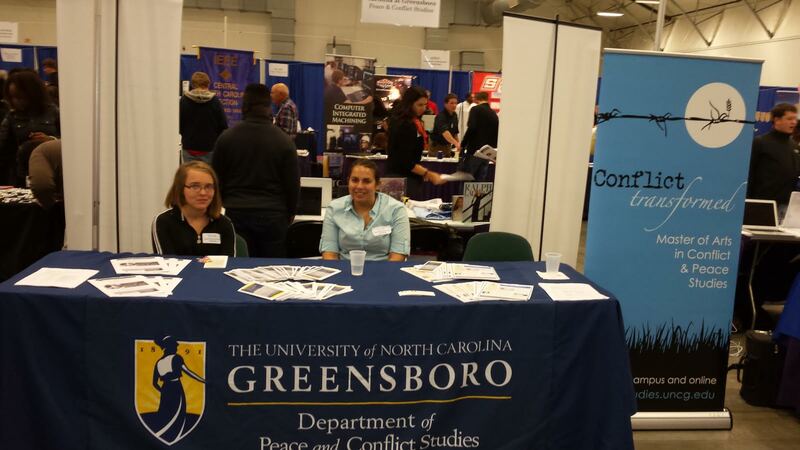 +1 336.706.5091 or Janeen Chastain at: jkchast2@uncg.edu. If you are interested in getting some conciliation training and experience – please come and get involved! SAVE THE DATES! Sept. 22nd – 5:00-6:00 PM. Place to be determined, but we will be on UNCG campus somewhere! Join the PCS Department on Thursday, Oct. 1st for a Book Launch/Open House at Scuppernong Books! Click Here for more details! Read Dr. Matyok’s newest article published in the Fletcher Security Review entitled: Time for a Re-write of the Guiding Principles for Stabilization and Reconstruction. Please join us in honoring our graduates on Thursday, May 7th at the Peace and Conflict Studies graduation ceremony. The event will be held in room 204 of the Stone Building and last from 5pm-7pm.Tom Matyók recently presented “The Meaning of Reconciliation for Stability Operations: Religious Actors in a Stability Environment Before, During, and After Conflict” at the Operational Art & Thinking Series, Civil-Military Interaction/ United Nations Department of Peacekeeping Operations sponsored by Multinational Joint Headquarters Ulm, Germany. On Thursday, March 5th Dr. Martin Welz from the University of Konstanz, Germany held a discussion on “Peace and Security within the African Union” in UNCG’s Faculty Center. 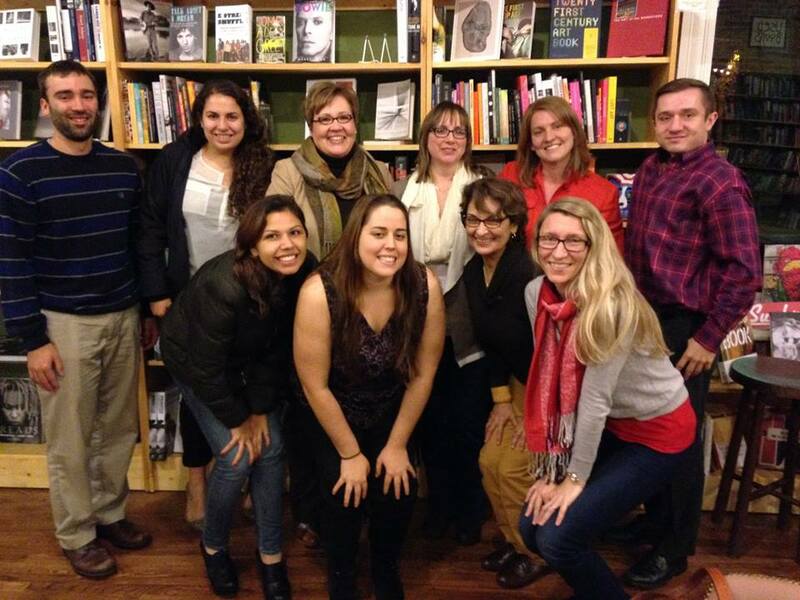 On Thursday December 4th the Peace and Conflict Studies Department held a networking event for their students and alumni at Scuppernong Books in downtown Greensboro. Laura Taylor and fellow team members presented in the Maple Room of the EUC. They spoke about their year-long project to identify how to prepare UNCG students for today’s work force. This year the GCS Career Exploration Fair 2014 had 1,142 in attendance and feedback from students, parents and the community has been extremely positive. Thanks to alumni and current students for volunteering your time and sharing your expertise. The event was hosted by GCS Student Services (Counseling Services) department and the CareerTechnical Education department and was sponsored by the Greensboro Chamber of Commerce. The Department of Peace and Conflict Studies (PCS) partnered with the Guilford County Schools (GCS) to host a training for the middle school peer mediators. Two MA alumna from PCS, Lila Markely and Valerie Glass, served as the facilitators for this event. This work built on their previous focus on education and professional practice during their degree. John Paul Lederach, PhD, Professor of International Peacebuilding and Director of Peace Accords Matrix at the University of Notre Dame’s Kroc Institute, presented the Department of Peace and Conflict Studies’ Annual Lecture Series event on Thursday, October 2nd, 2014. Lederach is widely known for his pioneering work in conflict transformation around the world, including in Colombia, the Philippines, Nepal, and countries in East and West Africa. He has helped design and conduct training programs in 25 countries across five continents. The author of 22 books, including most recent When Blood and Bones Cry Out: Journeys Through the Soundscape of Healing and Reconciliation, discusses how people heal and reconcile after violent experiences that defy words. This public lecture explored how to address social healing and reconciliation through metaphors, music and unforgettable stories of suffering and hope using approaches that explore healing as circular, dynamic and ongoing in the midst of continuing violence. 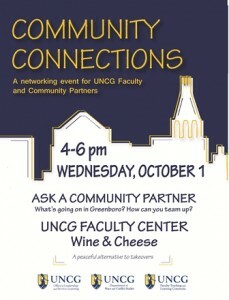 On Wednesday, October 1st, 2014 UNCG faculty, students and community members gathered to talk about what’s going on in Greensboro and how to collaborate. See flier for more information. ISIS: A Long-Ignored or Emerging Problem? 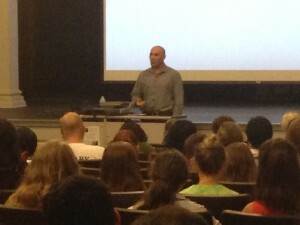 Dr. Ali Askerov, Assistant Professor in the Department of Peace and Conflict Studies at UNCG, gave a presentation on the terrorist organization known as The Islamic State of Iraq and the Levant(commonly referred to as ISIS and ISIL) on September 18th, 2014. This event was sponsored by the Islamic Studies Network and co-sponsored by the Department of Religious Studies & the Muslim Student Association. David Edgar is a British playwright and journalist with over 60 published and performed plays on stage, radio, television and film. His current play, Iron Curtain Trilogy marks the 25th anniversary of the fall of the Berlin Wall and subsequent collapse of the Soviet Union. This series of three productions, performed by Burning Coal Theatre in Raleigh, cover themes from political drama around art, refugees and history, to the quest for freedom in fall of Communist governments in the former Soviet-bloc. His works incorporate diverse languages across characters and presents how the power of ambiguity may make or break a peace process. 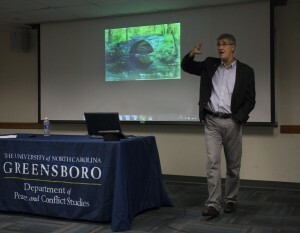 At UNCG, Edgar discussed the role of theater in promoting dialogue around the issues of peace, violence, and the language of conflict. This engaging and enriching discussion about art, peace and conflict helped explain how lessons from past conflict can be applied in today’s world. The Department of Peace and Conflict Studies held a New Student Orientation for the 2014-2015 academic year on Thursday, August 14, 2014 from 5-7 p.m. The orientation took place in room 186 in the Stone Building. Dr. Tom Matyók attended a session at the United States Institute of Peace (USIP) in Washington, D.C., Ending Wars to Build Peace: Conflict Termination Workshop. Click here for more details. We’re delighted to report that Dr. Emily Janke, Associate Professor in the Peace and Conflict Studies Department, will be a member of the National Advisory Panel for the 2015 Elective Community Engagement Classification through the Carnegie Foundation for the Advancement of Teaching and the New England Resource Center for Higher Education. Click here for more details. 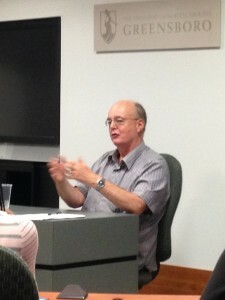 Dr. Tom Matyók recently participated in two major events in the field of peacebuilding education. First, he attended the Alliance for Peace Annual Conference in Washington, D.C. Dr. Matyók then joined leaders in the field for the Fourth Annual Peace and Conflict Studies (PACS) Graduate Education Symposium held at George Mason University in Washington, D.C. Click here for more details. Saferworld, the US Army Peacekeeping and Stability Operations Institute, Massey University and the Joint Center for International Security Force Assistance hosted an interactive discussion on transitional security design. They examined the nature of conflict compared to its definition in policy, and focused on how to define and include a community security perspective in this work that engages local understanding of security with that of outside implementers. Click here for more details. For more information about PowerUP, click here, and to register for this training, click here. Special Peace and Conflict Studies event to congratulate our graduating students of the class of 2014. To read more about David Smith’s work, go here. 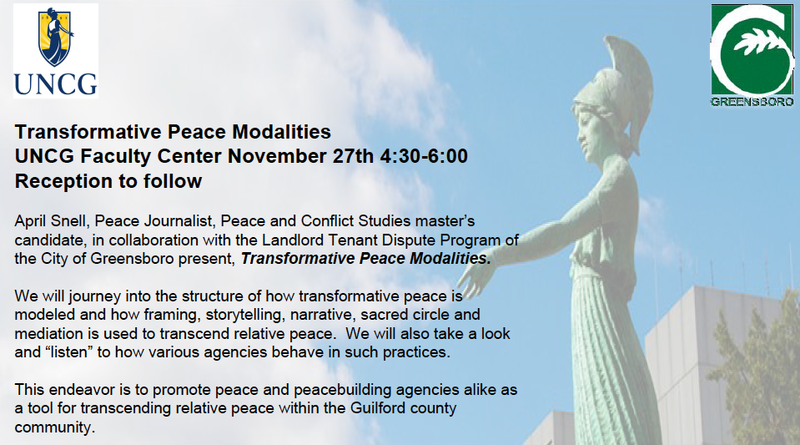 As a continuation of the dialogue about restorative practices, begun last fall during Howard Zehr’s visit, the Department of Peace and Conflict Studies hosted a screening of this documentary followed by an engaged discussion. Click here for more details. Ali Askerov, Assistant Professor in Peace and Conflict Studies, led an informal discussion about the role of Islam in the U.S. and around the world. This presentation – and invitation to dialogue – by Rob McAndrews focused on the genocides and mass atrocities of the 20th century. We explored lessons learned in order to put an end to mass violence and war. Click here for more details. Journey of the Universe/Journey of the University or What’s an Education For? Environmental issues through the 2013-2014 UNCG Think Tank Class Ecologically SANE’s conference on Chautauqua at the University of North Carolina at Greensboro. Click here for the conference flyer. The CPS Annual Speaker Series hosted Howard Zehr; to read more about this event and Zehr’s visit to UNCG, click here. Co-sponsored with: Office of Research and Economic Development; Institute for Community and Economic Engagement (ICEE); Innovations in Interpersonal Violence Prevention Research Group (IIVPRG).